Spring has sprung! Only, those little shoots of spring flowers that were starting to peep through in my flower beds are now being coated in a nice spring snow. I shouldn't be surprised, it seems to be typical here to have one last snowfall before we can really enjoy spring. With spring comes a busy schedule again at my house with sports and end of school activities and shows. 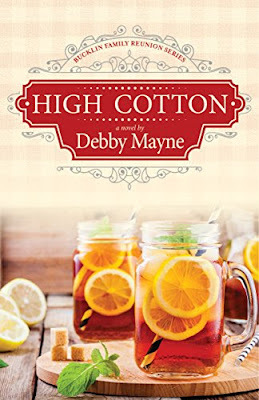 While I enjoyed the wind down of the winter, I read the new book by Debby Mayne, High Cotton. High Cotton is the first in the Bucklin Family Reunion Series. The Bucklin family is a very relate-able family and I really enjoyed the format in which the story is written. The author used the point of view of four female members, by birth or marriage, of the Bucklin family to tell the story, which is set primarily in the weeks leading up to what we learn is a more than once a year family reunion. The use of multiple viewpoints is a great way to engage the reader and provide insight to the family. I love that the reader gets the impression that it is one of those events that no one really wants to go to, but everyone realizes that you can't miss it, or you will be the topic of conversation for the family. This is so real life, how many events and not just family events, do we commit to attend, not out of want but out of obligation. Of course, it also made me appreciative of the family that I have and the closeness we have. I was fortunate to grow up in a family where we spent a lot of time with my grandparents, aunts and uncles and cousins and I actually look forward to seeing the family, but as we have grown bigger (and older), it certainly is harder to get together, making those opportunities so much more important to me. Of course, there are several things I have attended out of obligation, so I can still relate. Another 'challenge' for the Bucklin family is that there seems to be a lot of pressure in the family around success, in life and love, and who can make the most and best food for the event. After all, who wants to be that person that shows up with a bag of chips or stack of plates to the family reunion? All four women had an 'image' concerns that they were facing. Some concerns were stuck in the old-fashioned values (or perhaps southern) - a woman should marry, a man should support the family and others were around perceptions of success - having a great job, owning a house. I feel fortunate that we are more inclined to celebrate success and not dwell on our differences. In fact, I don't always see a lot of comparison in my family, but I also know that there is a little bit of that out there, as with most families...my grandma always told me that she enjoyed my wedding the most and I certainly enjoyed knowing that (whether she told us all or not, I don't know, but it doesn't matter because I know she enjoyed mine for sure. I liked that all four women experienced growth through the course of the story. They came to renewed perspectives on their situation, they learned that the truth is important and that people can surprise you and they recognized that faith is important in their lives. For several of them, they developed stronger relationships with family members. Learning from them and even going into business together. Some entered into new relationships, with promise for the future. I really enjoyed the way the story was told by the four women. The characters were familiar and enjoyable and the story was filled with a real perspective and a good balance of humor. The multiple points of view led to short chapters, which made it easy to ready in short or long installments. I look forward to the next reunion story in this series. One thing is certain: Life with the Bucklin family is never boring. Learn more about Debby and her works on her site.